Star Trek: Asterisk "Weekly Aftermath - Assignment: Bread Preservers"
Oh. Hey, you guys. I didn't know you'd be here. What's that? A new episode of Star Trek: Asterisk? Of course I've got one of those for ya! *pulls mechanical pencil out of his pocket and clicks it* Here we go! 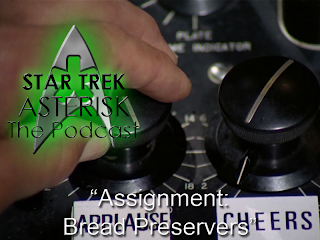 This week, Steve and I cover the final two episodes of season 2 of The Original Series: "Bread and Circuses" and "Assignment: Earth". Also, Steve includes a special segment on the history of the Preserver alien race. Come through the other side of the vortex and find the audio here.